Fantastic effort from everyone yesterday. Over 500 runs scored in 70 overs, we should be charging people to watch this stuff..!! Another steaming hot day which started well with skip calling the toss, and after a long hard think decided to bat first. Jason and Sam took to the crease, and basically stayed there. Sam set the standard, hitting a rather bemused opening bowler all round the park, at one point there were search parties looking for two 'lost' balls. The Ace did not hit any of the opening bowling, in fact when Sam reached his 50 Jason had scorched his way to 4, however he was just getting warmed up. The pair put on a near 200 run opening stand breaking many a record, including one of Peg's, Sam didn't offer a single chance on his way to a thoroughly deserved century and by this point the the Ace was also in full flow, shaking off his slow start, he was now in control. As he hit yet another four he ran down the pitch screaming 'come on the Ace'...vintage stuff. Sam finally fell rather unfortunately to 'Mr floppy hat' after the ball came of his leg and onto the stump, a great knock, leaving the way clear for the Ace to get his ton. However... oh calamity..!! as the Ace entered the 90s he went for one too many quick singles and was sent on his way after a direct hit. Still, it was a fantastic effort. The innings was rounded off with some quick knocks from Peg and Tim, however Mark looked a little disappointed not to be given out LBW...however not to worry we'll trigger you next week..!! With a lightening outfield and an outrageous slope we knew the game was not won yet. James opened and his first few balls were straight and true until he sent down a 'buffet ball', the batsman's eyes light up and he smashed it...straight down Peg's throat, a great start. 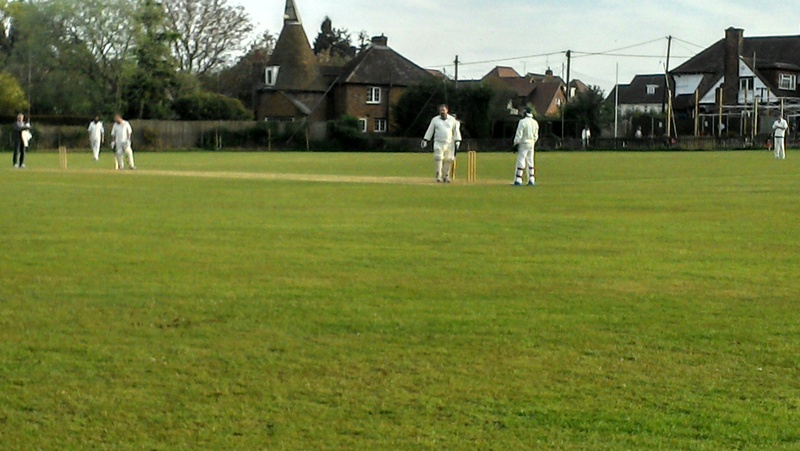 However, their captain 'the Heff' was a good batsman and he started to get his eye in. It was still hot so we started sharing the bowling around and Billy had a very tidy spell, but the heff was still there and was keeping up with the near 8 an over that was required. It was time for the Ace who responded brilliantly, slowing the run rate and taking four wickets and a catch in the process. Charlie switched ends and bowled a very good second spell, Bob was line and length and Peg stuck at it and although taking a bit of tap, he kept his nerve and got a vital wicket towards the end of the innings. In the field Mark patrolled the boundary edge with vigour saving many a four and Richard M, in a crucial position in the covers, put his body in the way of numerous flowing drives. In the end they finished about 30 runs short, but without all those quick singles and diving saves in the field it could have been a different story. So well done, everyone contributed to the win.